Arca-Swiss 4 x 5 view camera outfit, owned and used by Ansel Adams from about 1964 until 1968.This view camera was used by Ansel Adams, then given to Liliane DeCock, his full-time photographic assistant. Liliane continued to use this equipment during her time as Ansels’ assistant, and for her own photography and travels throughout the United States. It has been retained by her son since her passing in 2013. All of the movements are functioning correctly, and the bellows appears to be light tight. The lenses stop down and the shutters are working. Everything that was in the case has been left there. 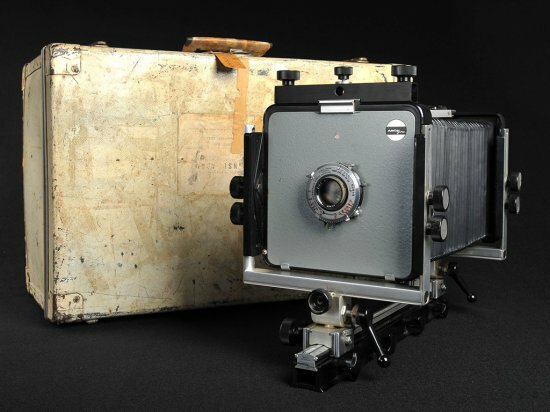 This is a rare opportunity to own an iconic view camera outfit owned and used by one of he most prominent photgraphers of our time—real, and all original—WOW! “Under the guidance of Ansel Adams and with a 4 x 5 inch camera lent to her by the artist, Morgan began photographing the landscape and soon developed a unique vision and printing style which utilizes the full tonal scale of the medium with a strong attention to the melancholic values.” Joseph Bellows Gallery. “Liliane worked with the famed photographer, Ansel Adams, for nine years, and began her own photography career after Adams loaned her a camera. She used a four-by-five inch camera lent to her by Adams, and she traveled the country on vacations to photograph landscapes,” said Willard Morgan, her son. “What she really appreciated about that time and about Ansel was … that he had a very expansive view of what’s possible,” her son said. “She came to him with not a lot of experience and [he was] able to see that potential and nurture it quietly.” In 1972, Morgan received a Guggenheim Fellowship and her work was exhibited at acclaimed venues including the Witkin Gallery in New York. That same year, Morgan was married to her husband, Douglas Morgan. The two had been introduced to each other by Adams.“They got married in Ansel Adams’ living room in Carmel (California), and Ansel Adams gave my mother away,” Morgan said. “He was in some ways like a father figure … he really supported her in all different ways at that phase of her life.” This collection has never been seen or offered to the public before this auction. In our research, we could not find an Ansel Adams view camera that has ever been sold or available prior to the Arca-Swiss we are presenting. We have done our best to accurately present the items, conditions and provenance of all of these important pieces. Most of the items in this collection are considered “professionally used” equipment, and as such, shows signs of wear and use. We have not made any effort to clean, repair, adjust or lubricate any of the items, instead, leaving all items in “as found” condition for the discerning collector. Certificates of Authenticity are available on any of the DeCock–Morgan Collection items listed..
Payment Instructions: Payment The credit card you submitted to register as a bidder was for verification purposes only—we do not have access to your credit card information. FOR US and CANADA BUYERS: If your are located in the US or Canada, and want to pay by credit card, either send an email (revivalauctions@att.net) or call (203-269-0569) with your credit card number, expiration date, cvc code and zip code to process this order. FOR INTERNATIONAL BUYERS: We DO NOT accept international credit cards. Please use the information below to wire transfer your funds. Revival Auction Company Account #: 0010866652 Routing#: 211170101 Webster Bank 64 South Main St. Wallingford, CT 06492, US (203) 741-6580 Revival Auction Company 6 Cooke Road Wallingford, CT 06492 Payment must be made within five (5) days of the close of the sale. Acceptable payments are made by bank wire transfer, check, or credit cards. Payment by credit cards is limited to buyers in the United States of America and Canada, or, by special arrangement, to buyers in other countries. Such arrangements must be made prior to the auction. Acceptable credit cards are Visa or Mastercard or the equivalent. All checks and other payments must clear before delivery of purchases unless prior arrangements have been made. Shipping Instructions: Shipping The buyer pays all shipping costs, and bears responsibility for any damage or loss during shipment. However, revival auctions will buy insurance on all shipments on behalf of the purchaser. Buyer is charged the direct cost of shipping and insurance plus a modest additional fee for packaging and handling. USA shipments are normally made by insured ups or insured registered mail, or, by special arrangement, with a courier service such as FedEx, UPS, or DHL. Purchases over $75,000 can be insured by special arrangement. Note that some countries have limits of insurance and therefore the liability for shipments above a country’s limit will be the responsibility of the buyer. Condition All items are offered “as is.” There is no return privilege, and all sales are final. We have sought to express a useful, general guide to the condition of each lot. We have also attempted to describe any damage or restoration, but our descriptions cannot be accepted as absolutely definitive and complete. The absence of such a reference does not imply that a lot is free from defects nor does any reference to particular defects imply the absence of others. Such information is given for guidance only and the condition of any lot, and the nature and extent of any damage or restoration should be confirmed prior to the sale. CONDITION RATINGS GUIDE New 100% new, never used. Sealed in original packaging, with all manuals and accessories included. Mint 98-99% of original condition. Almost new, very difficult to find any imperfection. All boxes and original packaging. Mint– 94-97% of original condition. Lens glass very clean, cosmetically may show very slight wear and/or signs of use but only under close inspection. Excellent++ 90-93% of original condition. Shows very slight signs of use, lens glass is very clean. Excellent+	87-89% of original condition. Shows slight signs of use, lens glass is very clean but may have some dust which will not affect picture quality. Excellent 75-86% of original condition. Average condition, signs of normal use. Good 60-74% of original condition. Appears to have been heavily used with multiple dings, scrapes, scratches and heavy brassing. Lens glass may have slight fungus, excessive dust and/or scratches that will likely affect picture quality. Poor 45%-73% of original condition. Very rough looking, impressions in metal, extreme finish loss and excessive brassing. Glass will have marks, fungus and/or haze which will affect picture quality. May need repair to be functional, or only useful for parts. Buyer’s premium There is a buyer’s premium of 23.0% for internet bidders. Estimates and reserves The estimated prices are the approximate prices expected to be realized, excluding buyer’s premium. They are prepared in advance of the auction sale and are subject to revision. Furthermore, they are not definitive and meant only to represent general guidelines. Every item in the auction has a “reserve” price. Internet bidding You will be able to bid in “real time” on-line during the auction. Internet bidders pay a buyer’s premium of 23.0%. Register for internet bidding at www.Proxibid.Com/revivalauctions Local taxes A 6.35% Tax is due on all deliveries made in Connecticut. However, all lots that are delivered outside Connecticut, by mail or courier, are not charged any USA taxes. Shipping The buyer pays all shipping costs, and bears responsibility for any damage or loss during shipment. However, revival auctions will buy insurance on all shipments on behalf of the purchaser. Buyer is charged the direct cost of shipping and insurance plus a modest additional fee for packaging and handling. USA shipments are normally made by insured ups or insured registered mail, or, by special arrangement, with a courier service such as FedEx, UPS, or DHL. Purchases over $75,000 can be insured by special arrangement. Note that some countries have limits of insurance and therefore the liability for shipments above a country’s limit will be the responsibility of the buyer. Payment Payment is made after the end of the sale, and, in any case, must be made within five (5) days after the close of the sale. Acceptable payments are made by bank wire transfer, check, or credit cards. Payment by credit cards is limited to buyers in the United States of America and Canada, or, by special arrangement, to buyers in other countries. Such arrangements must be made prior to the auction. Acceptable credit cards are Visa or Mastercard or the equivalent. All checks and other payments must clear before delivery of purchases unless prior arrangements have been made. The following provisions constitute the entire agreement between the Revival Auction Company LLC, the consignor, and the buyer, and will govern the sale of all property sold through live and internet bidding at any Revival Auction Company LLC auction conducted in Connecticut and on line at www.Proxibid.Com/revivalauctions.Com. 1. Buyer’s commission On-line internet bidders will pay a buyer’s premium of twenty three per cent (23.0%). These commissions are payable in addition to the winning bid price. 2. Condition of property All property is sold “as is” without warranty or guaranty of any kind whether expressed, implied or statutory including without limitation any warranty or guaranty as to character, fitness for a particular purpose, merchantability, physical condition, or rarity. Prospective buyers must rely solely on their own inspection and knowledge before bidding to determine such issues as age, quality, character, physical condition, mechanical and electrical function and rarity. There is no return privilege, and all sales are final. 3. Withdrawal of property The Revival Auction Company LLC, and consignor reserve, in their unfettered discretion, the right to withdraw any property from auction before sale. 4. Disputes Any disputes between bidders shall be resolved by the Revival Auction Company LLC, who may offer and resell any property over which there is a dispute. 5. Bids, rejection and reserves The buyer shall be the highest bidder. The Revival Auction Company LLC, may reject any opening bid they deem too low and withdraw the property from sale. Likewise, in the course of bidding they may reject any advance as being too low. Generally, the Revival Auction Company LLC, will require that all bids advance the price by not less than 10%. All items of property will be sold with a reserve which may be confidential. The Revival Auction Company LLC, may bid on behalf of the consignor to effectuate the reserve. Responsibility for bidding is ultimately the prospective buyer’s, and the Revival Auction Company LLC, assumes no responsibility or liability with regard to bidding. 6. Possession, title and risk of loss Buyer will receive possession of the property only when payment has been made in full and all funds have cleared. Title and risk of loss will pass to the buyer after the buyer has made payment. 7. Terms of payment and remedies Buyer agrees to pay for property within five (5) days of sale. Payment must be made in US Dollars (USD) and may be made in any one of the following: cash, check, credit card, debit card, bank draft or bank wire transfer. Purchased property will not be released to the buyer until payment in full has cleared. In the event buyer fails to pay for property, the Revival Auction Company LLC, may in its sole discretion and in addition and without prejudice to any other right or remedy available to it in law or equity, exercise one or more of the following rights and remedies: A. Bring an action against buyer seeking damages for breach of contract including court costs and attorneys fees. B. Rescind the sale of the property or any other lot sold to the buyer. C Resell the property at auction or private sale and bring an action to recover any deficiency between (i) full amount owed by buyer plus court costs and attorneys fees and (ii) the net proceeds, after payment of all expenses, received from the resale. If there is a surplus, the surplus will be paid to consignor. D. Store the property and release it to buyer only upon payment of the full purchase price plus all direct and indirect costs of storage. E. To charge interest at 18% per annum commencing immediately after failing to pay on time. F. To retain any other lot sold to buyer at auction. G. To apply any amount owing from the Revival Auction Company LLC, to buyer against the purchase price and all expenses due and owing by buyer to the Revival Auction Company LLC, the Revival Auction Company LLC, is likewise be deemed to have a security interest in any property of the buyer in the Revival Auction Company LLC’s possession to secure payment of the purchase price and all expenses due and owing from buyer to the Revival Auction Company LLC. H. To apply any payment made by buyer to the Revival Auction Company LLC, for any purpose and despite any instructions by buyer as to application, against the purchase price and all expenses due and owing. 8. Sales and use tax The total purchase price of all property will be subject to all sales or use tax which the Revival Auction Company LLC, is obligated by law to collect. A 6.35% Tax is due on all deliveries made in Connecticut. However, all lots that are delivered outside Connecticut, by mail or courier, are not charged any local taxes. The Revival Auction Company LLC, is not obligated to collect tax on any item that is delivered outside the State of Connecticut. 9. Terms of adhesion By bidding at the auction, the buyer acknowledges and agrees: A. That the foregoing terms and conditions will represent the entire agreement of the parties, provided that the terms may be altered or amended by the Revival Auction Company LLC, prior to or at the time of auction by oral or written announcement or posted notice. B. That the rights and obligations of the parties will be construed and governed by the law of the State of Connecticut. C. That jurisdiction for the resolution of any dispute between the parties related to the auction, will be exclusively in the state of Connecticut and consents to the jurisdiction of the Connecticut state courts and federal court for the district of Connecticut. 10. Limitation of liability The Revival Auction Company LLC’s and consignor’s liability to a buyer shall not exceed the purchase price actually paid. 11. The Revival Auction Company LLC, as agent only Except as otherwise specifically stated in writing, the Revival Auction Company LLC, is acting only as an agent for the consignor. The Revival Auction Company LLC, will have no liability for any breach by either a consignor or buyer.